I spent a couple years working in Saudi Arabia, and when you live in an area so remarkable for such a short amount of time, there will always be opportunities missed. One of the things I wish I had been able to fit in while living in the Middle East was a trip to Morocco. For someone like me who thrills at the sight of handmade ceramics and carpets and the aromas of local food, this would have been the trip of a lifetime. Who knows, I may still go someday. In the meantime, I will satisfy my senses with Moroccan flavors in my food, like this stew (tagine) I make in the slow cooker. 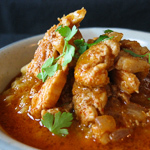 The tagine has harissa, a traditional spice mix, and preserved lemons, both staples of Moroccan cuisine. Harissa can be quite spicy, so adjust to your heat tolerance. 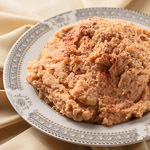 You can make your own harissa and preserved lemons or purchase them at international grocery stores, specialty stores, or online. Strictly speaking, traditional tagines don’t normally require browning the meat, though they also don’t use an electric slow cooker, either. I think the difference in flavor from browning the chicken is certainly worth the extra time, and I do it here. I also skipped dried fruits, unsure as to how my guys might react to them, though I’ll throw in prunes next time because I adore them. I made the Marrakech tagine bread (the flatbread in the photo) from Paula Wolfert’s new book The Food of Morocco to go along with it, and that was an instant hit with the family, so much so that I may have to start buying semolina flour in bulk. If you like flatbread, this is one you’ll love, and I will post the recipe soon. In the skillet, warm the olive oil over medium heat. Season the chicken with black pepper and place the pieces in the skillet skin side down and cook just until brown, about 8 to 10 minutes per side. Place the chicken pieces in the bottom of the slow cooker and put the lid on to keep the chicken warm. Drain most of the oil out of the pan, leaving just enough to cover the bottom. Add the onions and sauté until browned, about 10 minutes. Add the garlic and cook about 2 to 3 more minutes. Pour the onion and garlic mixture over the chicken in the slow cooker and add the chickpeas. Add the harissa paste, salt, and tomato paste. Add the sweet potatoes, celery root, carrots, red potatoes, and the preserved lemon, then pour the water over it all, stirring the vegetables gently to make sure they are all covered. Cover and set the temperature to low and allow to cook for 8 hours. Before serving, remove the lemon and use tongs to fish out the chicken pieces, then remove the bones and skin and put the meat back into the pot. You can also serve the pieces whole on the side for those who prefer it that way. Serve with couscous, quinoa, rice, or flatbread. What a tantalizing recipe! We simply love the combination of chicken and garbanzos (that’s how we refer to chickpeas down here). 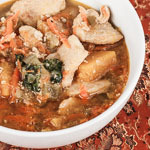 Perfect for the rainy season and on days you just want to cozy up and eat something comforting. Thanks for linking to my tagine post. 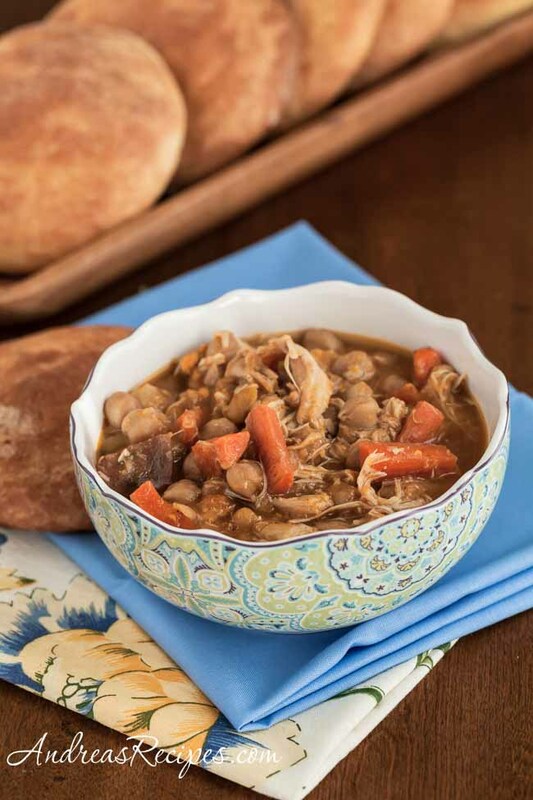 Such a great idea to use the slow cooker for tagine. Looking forward to your flat bread post, can never get enough of flat bread recipes 🙂 and your photos are amazing! Thanks Zane & Van, I like the chicken and chickpeas combination, too. Thanks for doing the research for us, Lydia! The tagine pots are beautiful and I’ve thought about getting one for serving, but wasn’t sure about using it for cooking. Thank you Shannon, I think you’ll really like the bread. Oh yes, this sounds like a definite winner! I love MIddle Eastern food, and the spicier, the better! This looks so comforting. Having just made a batch of Harissa, this is the perfect time to check out a ‘tagine’ recipe in the solar oven. Just pop it in, in the morning, and then enjoy at the end of the day. Yummy. Thanks for sharing. Looking forward to the bread recipe, too! Come visit when you can. I love Tagine’s and living in spain they are available in a lot of local restaurants, I often make them at home too, but have been waiting until I can purchase the ideal tagine cooking pot in order to photograph the dish for my blog LOL. You are welcome to join in my food blogger event THE SOUP KITCHEN, here It’s not just about soup, but dishes that resemble soups too, take a look. All bloggers are welcome, hope to see you participate soon. Made this last night, sans preserved lemon, and it was delicious! I also added in a few parsnips since, well, I just love parsnips.